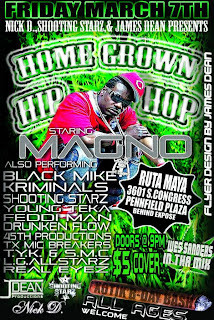 From the home grown like in the closet with fluorescents department... Magno @ Ruta Maya on Friday, March 7th for Home Grown Hip Hop presented by your local pharmco Nick D., Shooting Starz, & James Dean. Also in the puff puff pass circle, Black Mike, Kriminals, Shooting Starz, Young Teka, Feddi Man, Drunken Flow, 45th Productions, TX Mic Breakers, T.Y.K. & S.M.C., L.G. Allstarz, and Real Eyez. Man after all that, I've got the munchies. Magno is a rapper from Greenspoint(North Houston) who started out doing underground appearences, but was first taken notice to when he started doing projects with DJ Michael Watts' Swisha House/Swisha Blast Entertainment record label out of Houston, Texas, a label known for bringing up underground artists to becoming multi-platinum major artists. Swisha House was also the starting point of artists Slim Thug, Mike Jones, Paul Wall & Chamillionaire. He imidietally started working on numerous mixtape projects that the label was releasing, including working on his first solo all flows mixtape entitled Collection Plate. Working with Mike Jones in his earlier time with the label, the 2 artists were paired up to release an album together entitled 1st Round Draft Picks, with noticable tracks such as Day 2 Day Grindin', which featured now platinum recording artist Chamillionaire. Magno eventually left the label and started his own called Wildlife Records, co-owned with his brother deetha Savor. The 1st project for Wildlife Records was a mixtape that was screwed & chopped by DJ Bull of Dirty 3rd Records entitled Mix Show Vol. 1, and their 2nd released screwed & chopped by DJ Luis entitled The Payday Mixtape. But it wasn't until 2004 that the public started recognizing that Magno can be a successful artist without the Swisha House label on his CD covers. He released his most anticipated solo mixtape since his Collection Plate release.